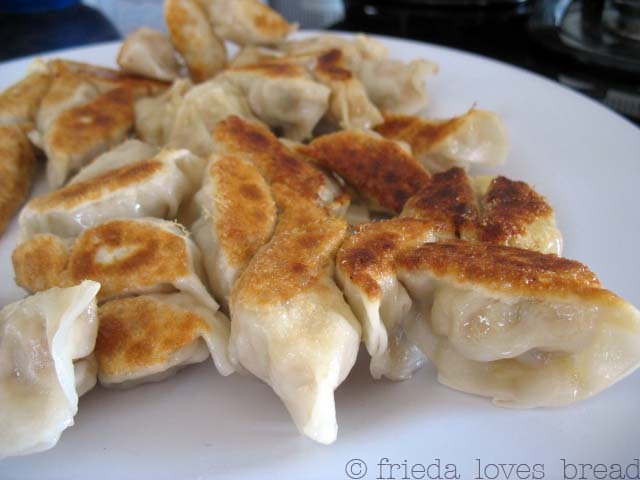 I have had this recipe for Gyozas bookmarked forever, hoping for a day to make these. The planets lined up when my neighbors called and asked if I wanted to help make gyozas over Memorial Day. Woot! Sharla, who makes these wonderful cakes, lived in Japan for a few years. Imagine my surprise when she was making gyozas from the recipe I had bookmarked! Are you ready to make these? 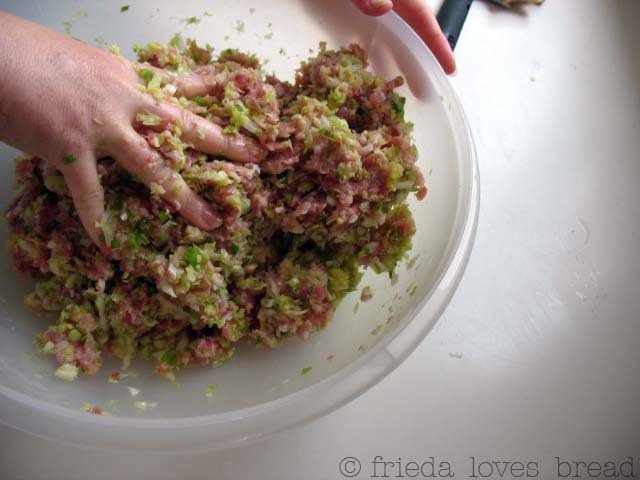 Four cups of minced Napa cabbage (use the frilly top half) is mixed in with salt in a large bowl. Why? Napa cabbage has a lot of liquid and the salt allows it come out and prevent the potstickers from getting mushy. The cabbage is then squeezed between two hands or in a cheese cloth to remove excess liquid and transferred to another bowl. 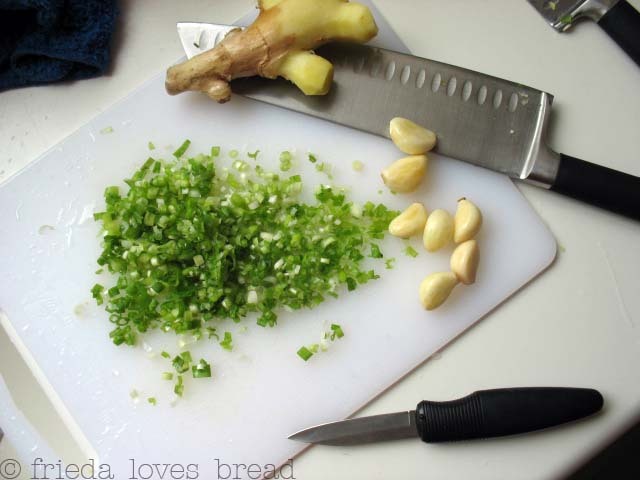 Chopped green onion, garlic and ginger are added. 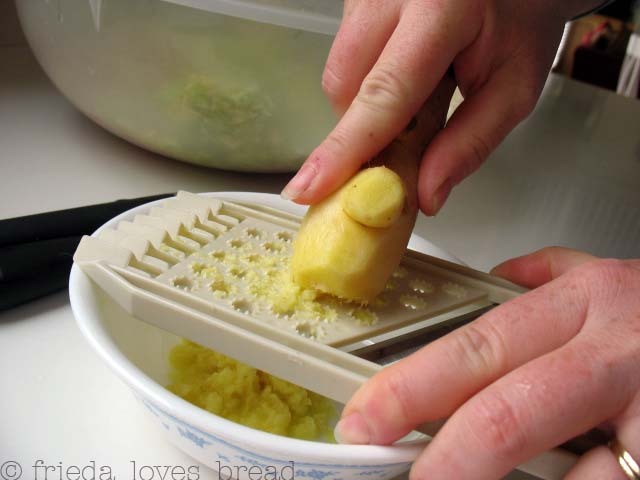 I use a microplane grater for my frozen ginger. Sharla uses this one that she got from Japan. Sesame oil, crushed red chili pepper flakes and a touch of sugar are added to the mix with ground pork. Red/Dark Miso paste is added to the mix. You can find this in an Asian grocery store. Your best mixing tool is your hand ~ you can make sure everything's evenly distributed and there's no major lumps of anything. Look at this cute family! You can tell they have a lot of fun putting these together. 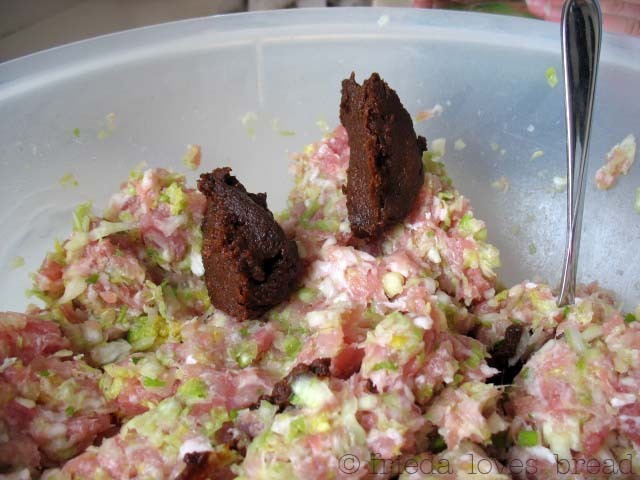 First, place a heaping teaspoon of filling onto your dumpling. 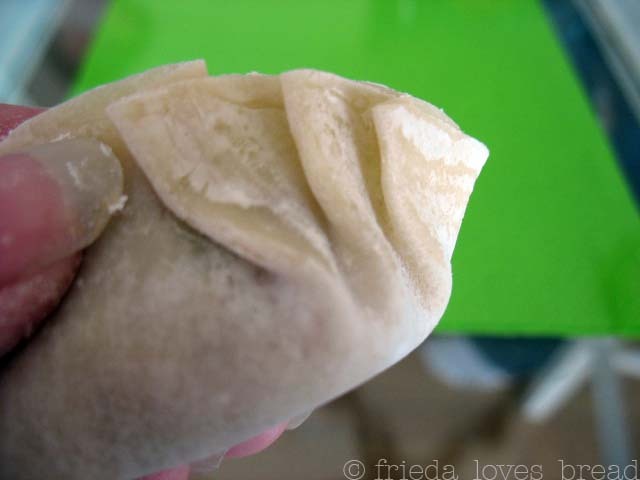 Fold the dumpling in half and pinch it at the top/center. Continue pleating, creating 3-4 pleats on each side. Yay! Once you get the hang of it, you won't be able to stop. It's that fun! A large skillet with 1 teaspoon of sesame oil is heated over medium-high heat. 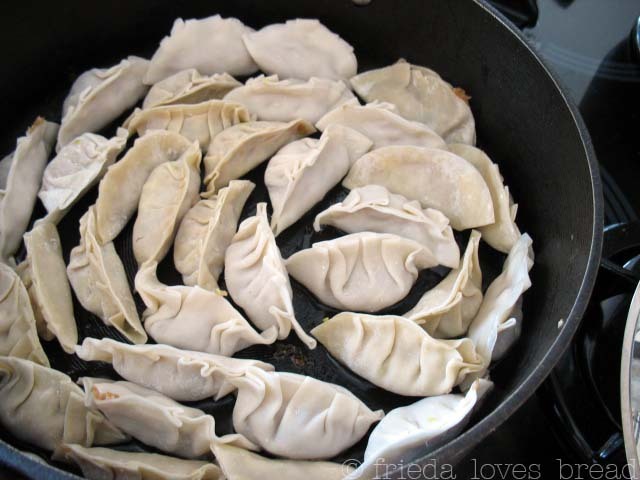 The filled gyozas are carefully placed into the heated skillet, pleated sides UP. Cook for about 3 minutes, or until nicely browned on the bottom. Use the skillet lid to shield yourself and pour in 1/4 cup water into the skillet. Drizzle 1/2 t. sesame oil around the edge of the skillet. Place the lid on the skillet to trap in the moisture and quickly lower the heat to keep the liquid at a simmer. Check the dumplings after 2 minutes. They should appear slightly transculscent and the meat feels firm when pressed lightly. Remove the lid and continue to cook till all the water has evaporated, and only the oil remains. When you hear a sizzling sound, shake the skillet. The dumplings should move about. Remove the dumplings with a spatula. Serve with dipping sauce ~ simply made from soy sauce, rice vinegar and chili oil (or sesame oil and red pepper flakes). Each person made their own dipping sauce to their liking. 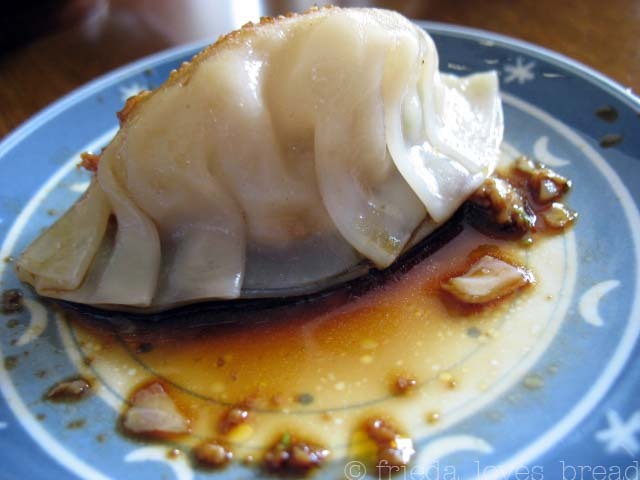 These gyoza dumplings were served with dipping sauce, a bowl of rice, and miso soup. Mix cabbage and salt in a large bowl; let sit for 10 min. 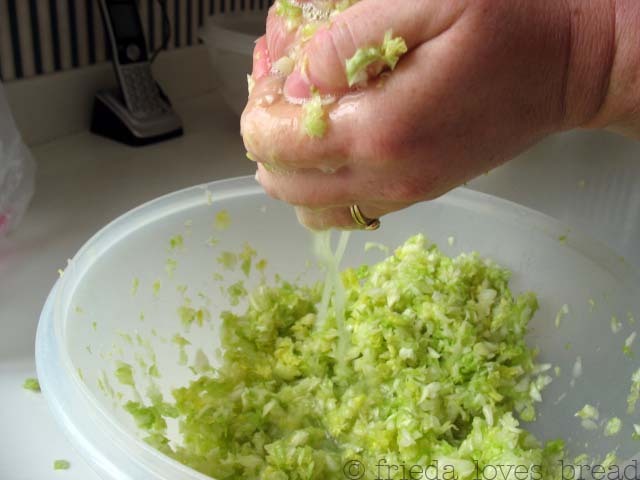 Squeeze liquid from cabbage with hands or cheesecloth and transfer to another bowl. Add pork, ginger, garlic, onion, miso paste, sesame oil, chili pepper flakes, and sugar. Mix well with hands. Place 1 t. of filling on middle of wrapper. Dip finger tip into bowl of water and trace outside circle of wrapper. Fold dumpling in half; starting in the middle and working toward the end, make 3-4 pleats on each side. 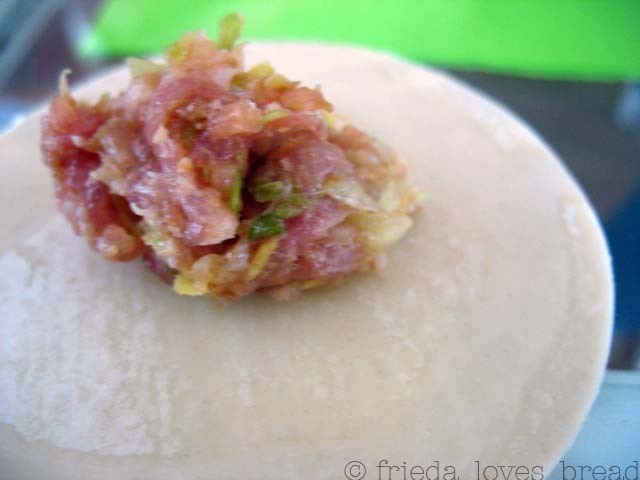 Cover pleated gyozas with plastic wrap until ready to cook. 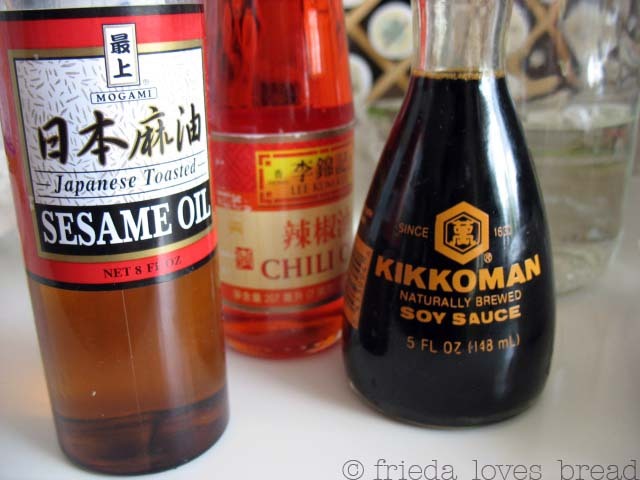 Pour 1 T. sesame oil into a large skillet; heat to med-high. Place gyozas, pleated side up. Cook for 3 min. or til browned. Sheild yourself with skillet lid and pour 1/4 c. water into pan. Drizzle 1/2 t. sesame oil around edge of skillet. 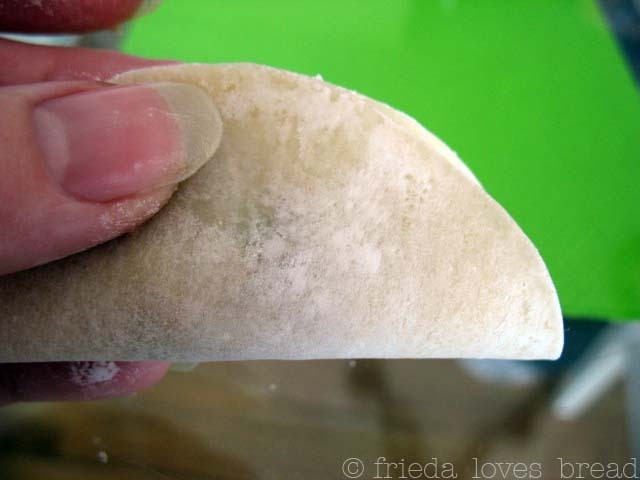 Cover and steam gyozas for 2 minutes or till slightly transcluscent and meat feels firm. Remove lid and continue to cook till liquid has evaporated. Remove dumplings with a spatula. Serve hot with dipping sauce. Feeling ambitious? 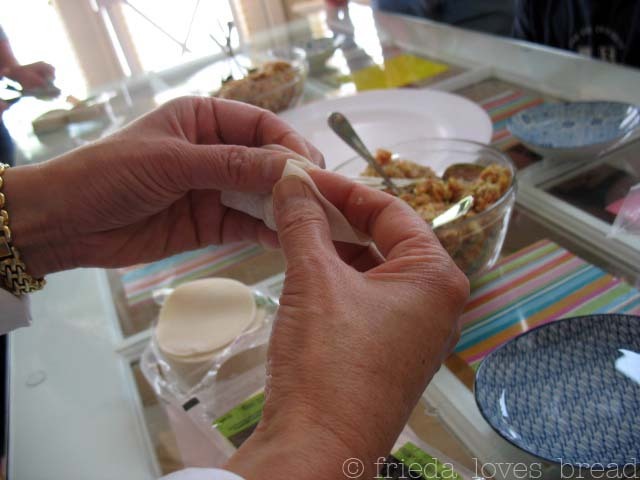 Wanna make your own gyoza wrappers? Rachel will show you how! You are a woman after my own heart! I adore gyoza/potstickers soooo much! I can't wait to try this recipe, and the tutorial is awesome. 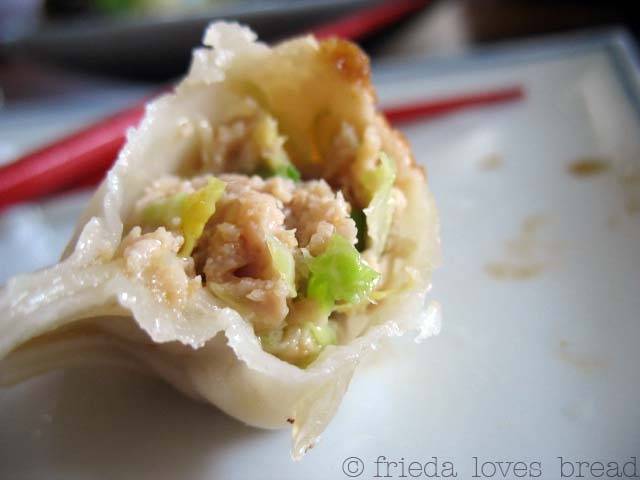 Thank you Frieda I just got my idea for the next girls night out....(we're too cheap to go out to eat - plus we annoy everyone because our group is so large and...loud) We'll have a gyozas party. 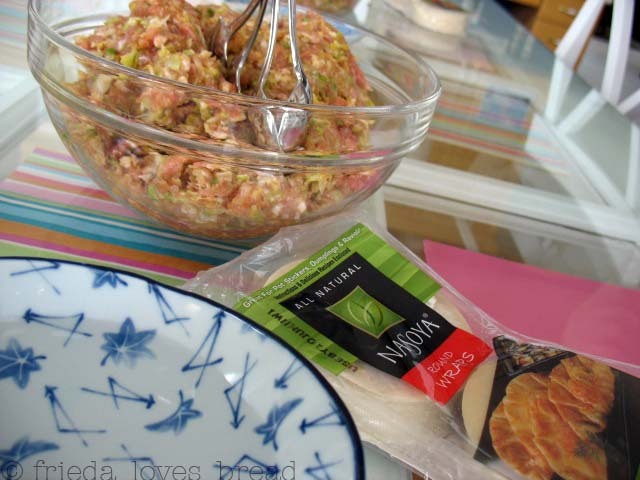 Jess, these are SO good ~ better than any frozen store kind and fun to make! So sweet of you to share with your dad! Gwenevere, this is THE perfect thing to do for a GNI (girl's night in!). 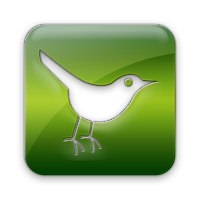 Have a great party! I have a Taiwanese friend who owns several restaurants. 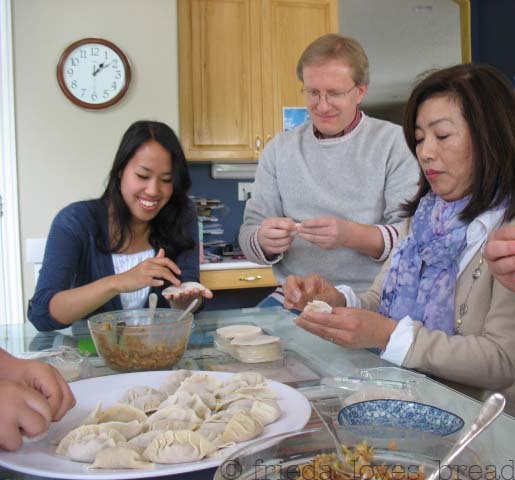 She taught me how to make pork potstickers once. I could eat nothing but them, but these sound wonderful with miso soup. 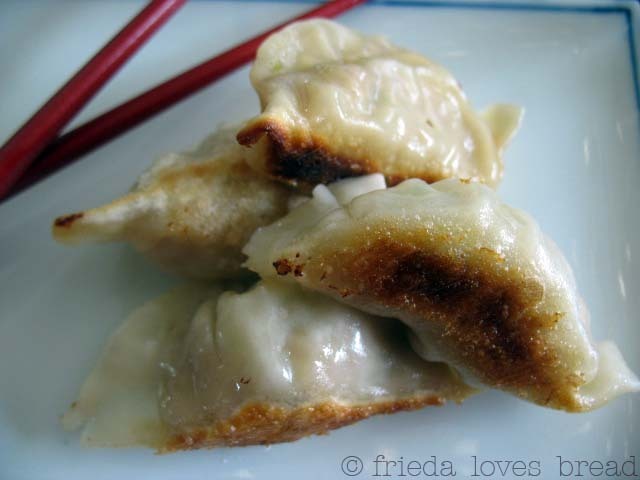 I love making pot-stickers...this is a beautiful recipe! Every time I fold them - no matter how hard I try - I can't get the pleats! Ann, I should have taken a picture of the gyozas the kids made...not perfect, but the main objective is to seal them so they don't burst during cooking! No matter how they look, they still taste great! Those looks just wonderful and fun to make too. Especially with a group of people. Great pictures. Love the Goyza and your post. 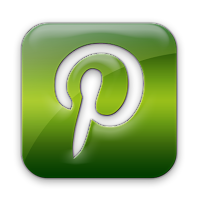 Wonderful pictures make it very easy to follow. Thanks for sharing!